It is important to remember to thoroughly clean and disinfect your feeding areas regularly to prevent the spread of disease. Sounds idyllic, but only if you keep up good hygiene practises! It is important to remember to thoroughly clean and disinfect your feeding areas regularly to prevent the spread of disease. When we provide food in our gardens we create a feeding hotspot which large numbers of birds can have access to. Diseases such as, Salmonella, Trichomoniasis, Aspergillosis and Avian Pox, can spread very easily through the wild bird population when birds are in close contact with each other in your garden. Diseases spread between birds in the same way they spread between humans, via direct contact, through contact with contaminated surfaces or by eating contaminated food. Salmonella is a bacterial infection that causes intestinal tract infection, resulting in diarrhoea. Any food contaminated by the droppings of sick birds will be a serious health risk to other healthy birds visiting feeding areas. Trichomoniasis is a parasite, some strains will cause sores in the mouths and throats of birds. These sores prevent the bird from swallowing resulting in dropped food, any bird that then consumes the dropped food is at risk of Trichomoniasis. Aspergillosis is a Fungal infection with can be found in damp or wet seed mixtures. Any fungal spores that are inhaled into the lungs will eventually result in bronchitis and pneumonia. Avian Pox is a viral disease which causes lesions on the unfeathered parts of the body, such as eyelids, legs, feet, around the beak and inside the mouth. This virus is easily spread via direct contact with infected birds at feeding areas. Most birds recover from the virus providing the bird does not suffer severe lesions around the eyes which may prevent the bird from finding food. To limit the spread of disease in your garden make sure you remove uneaten food every time you refill your feeders, this is essential if the food is damp as this will reduce the risk of diseases such as Trichomoniasis. Any food in hanging feeders that has not been eaten within a week is best discarded and replaced with fresh food. If you feed from a bird table or ground table only put out enough food that will be eaten in a day and keep the surface clean to prevent a build-up of harmful bacteria and mould. Removing uneaten food also helps to reduce the risk of unwanted pests. We recommend using a 10% bleach solution at least once a month to keep feeding areas free of bacteria and diseases. Always wear rubber gloves to keep yourself safe from harmful bacteria and diseases. 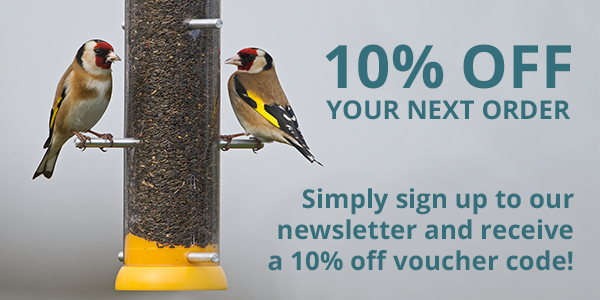 Every few weeks move your bird table or feeding station to fresh ground so that uneaten food does not accumulate in one area of your garden, this also helps to prevent damage to your grass. Do not let husks accumulate around feeding areas as mould and bacteria will quickly develop, if you feel it is unpractical to clear up dropped husks every few days then feed our No Mess Mix. If you supply water in your garden for the wild birds you must refresh it daily, especially if there are droppings or spilt food present in the water. Birds use water to bath in as well as to drink so water sources can quickly become contaminated with diseases and bacteria. We have sourced the best easy to clean feeders for your convenience, our Ring Pull ProTM hanging feeders do not require tools to take apart and the bottom twists off to allow you to quickly empty out uneaten food every time you refill the feeder. 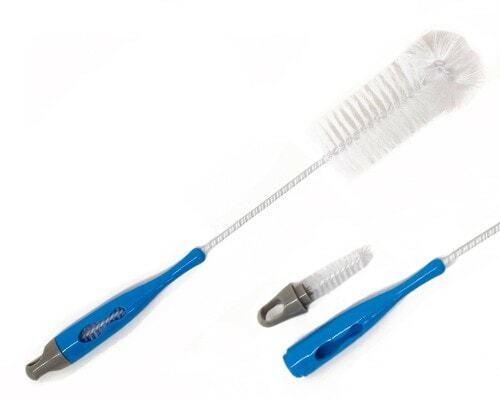 To help you effectively clean inside the tube and around the ports we have great cleaning brushes in stock to make cleaning even easier. With the recent 2016/2017 Avian Influenza preventative measures that have been enforced by DEFRA it is a reminder of how infectious some diseases can be, we cannot stress enough how important it is to keep feeding areas clean for the health of our wild birds.